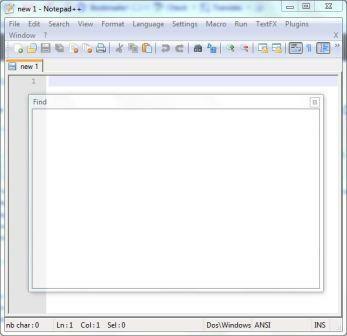 When using Notepad++ text editor, a popular Notepad replacement, in Windows 7, a strange problem is causing the Find (Search) and Replace dialog boxes do not close and exit properly when user clicks on “Close” button. Instead, a partially transparent version of the dialog window remains within Notepad++ window. The translucent window is inactive, and not responding to any keyboard press or mouse click, but linger around until Notepad++ application is restarted. The error of non-exiting of Find and Replace dialog windows is probably a bug in Notepad++ in Windows 7. The error is probably due to implementation of transparency support for Find or Search and Replace dialog window, which allows user to make the dialog always transparent, or on lose of focus, at the preset transparency level. Thus, to fix the abnormal and annoying translucent dialog box been left on Notepad++ window when supposedly been close, try to turn off the transparency for the Search and Replace dialog window. To disable transparency, untick the check box for Transparency in the bottom right corner of the Find or Replace dialog. The bug always gone away when the transparency setting is set to Always instead of “On lose focus”, which served as alternative for users who prefer the transparency effect. Once transparency is disabled or changed to always on, the dialog box for Find or Replace should now disappear and exit completely when closed.